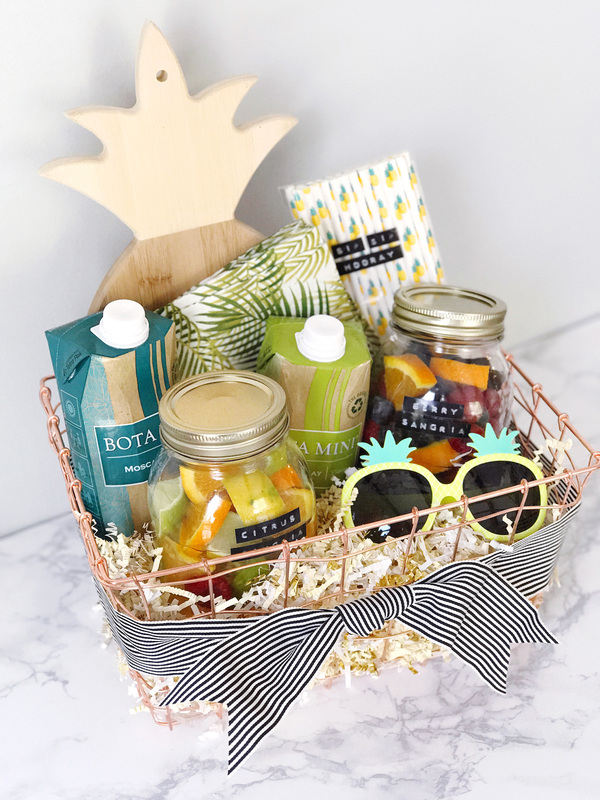 When I say hostess gift, what’s your go-to idea? I bet it’s wine! I love giving a bottle of wine when I get invited somewhere for dinner, or a bottle of bubbly for brunch. I was thinking recently about ways to jazz up this traditional hostess gift with something a bit more fun and unexpected. 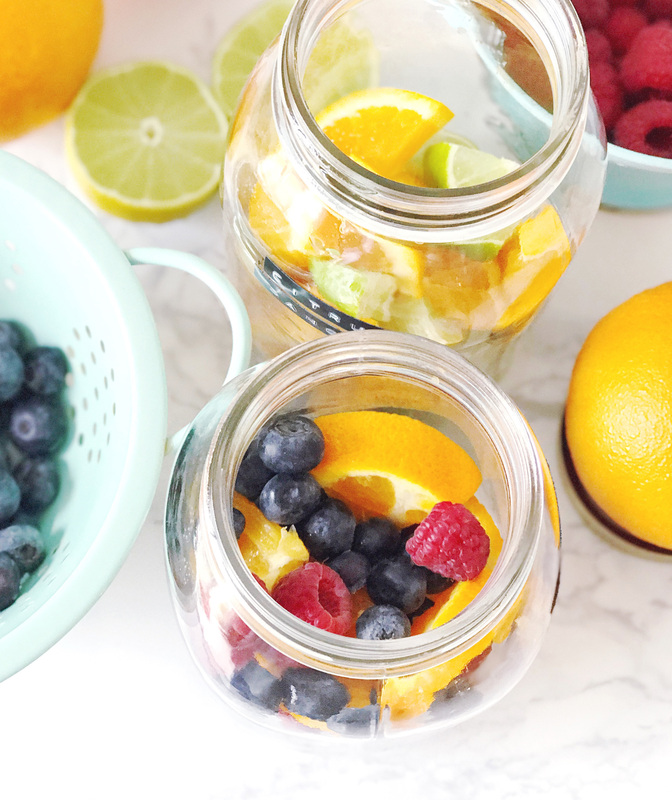 Warmer weather is right around the corner, and I love a glass of fruity, crisp white sangria. My DIY light bulb went off and I thought how fun it would be to make a sangria kit to bring along to parties. 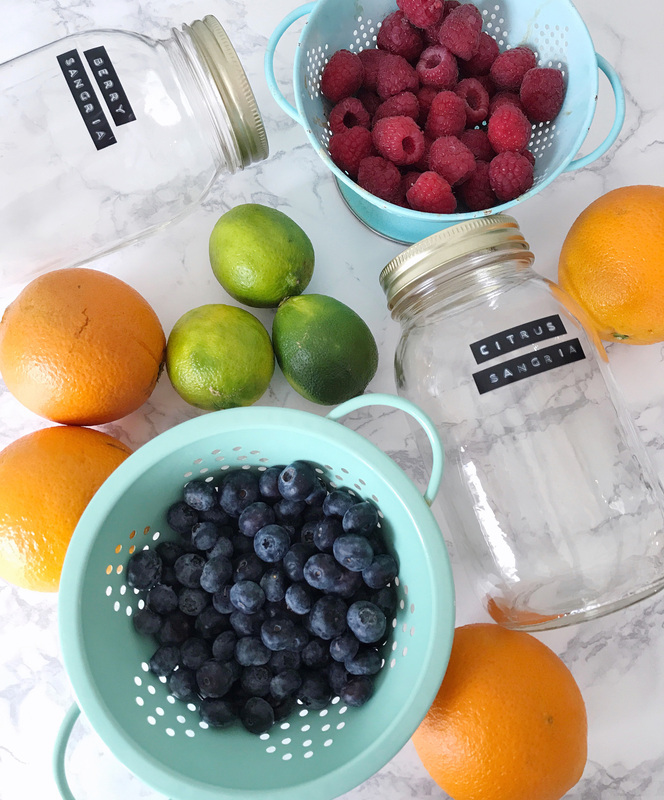 Making the sangria base is almost foolproof; I mixed and matched a few combinations of fruits in mason jars to create different sangria flavors. 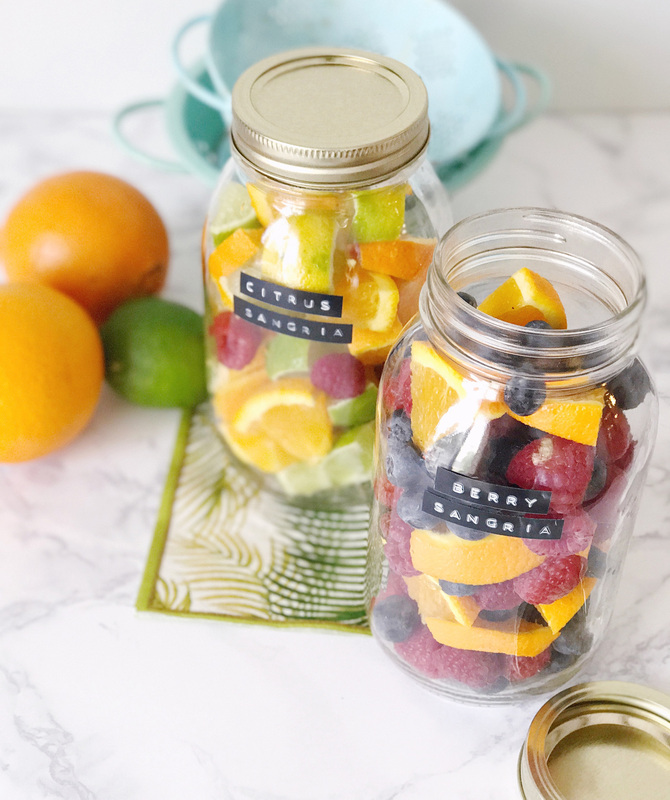 Orange slices, blueberries and raspberries in one, and a ton of different types of citrus in the other. Add a little bit of water and just a teaspoon of sugar into the jars before sealing them up to create a sweet simple syrup out of the fruits. I labeled each jar with some old-school black and white labels from my label maker too! 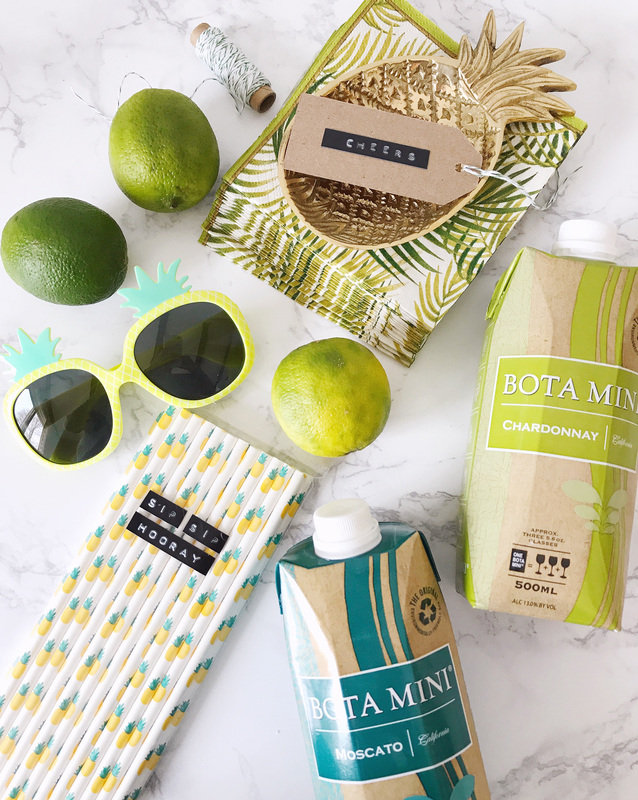 For wines, I chose some Bota Mini flavors that can be mixed and matched with the fruit bases. I love these wines for their convenient (and colorful!) 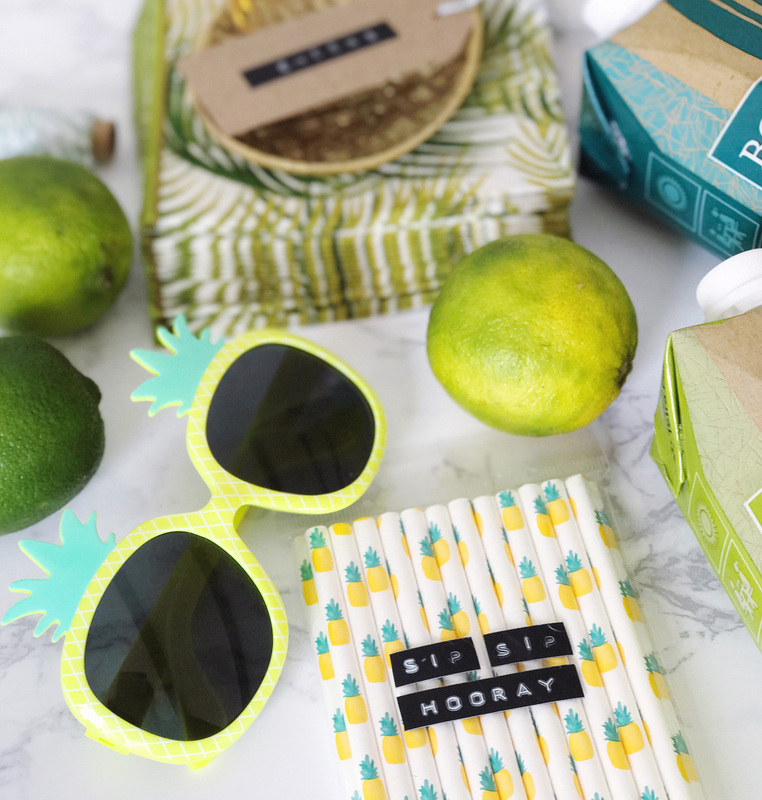 packaging — they’re 100% recyclable, how cool is that? They’re great quality wines to serve as a base for the sangria. Plus we love to bring cocktails to the beach in the summer for an evening happy hour or pizza night date and they’re a great alternative to bringing glass (and a corkscrew!) to the beach. They travel well, and look so cute in my sangria kit basket! Please note: this post was created in partnership with Bota Box wines, all opinions, images, and ideas are my own. The Download – 05.12.17 Summer Entertaining Tricks. 5 Responses to "Sangria Hostess Gifts." 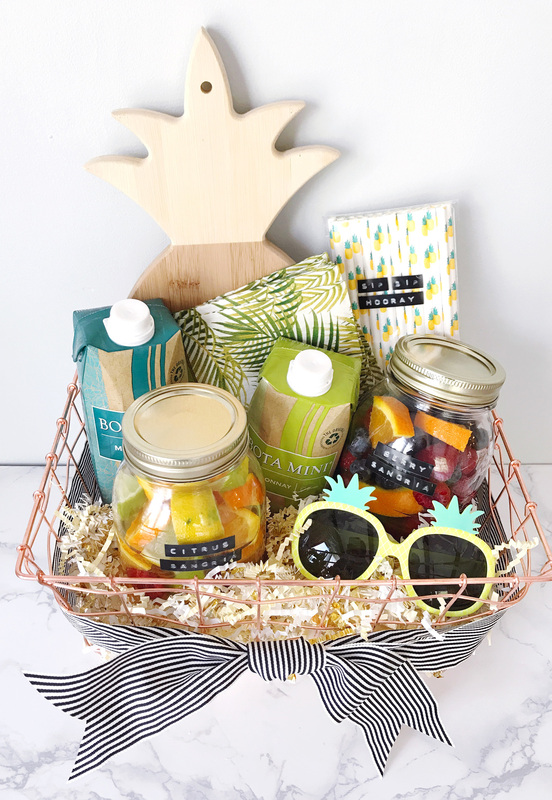 Do you have a go-to Sangria recipe to go with this kit? Would love to hear it! 🙂 Cutest pineapple cutting board too! Just add wine to the mixture, that’s it! I don’t follow exact measurements for sangria, it’s a bit of a mix of what I’m feeling each time.